Nowadays, everywhere we go we're inundated with weight-loss or weight-management messages. Whether it's Atkins, or Wheat Belly, 100 calorie treats or Omega 3s, this new language has become part of our daily lives. The thing is, a lot of people still don't eat well, their bodies are fighting with them, and they don't know why. A few years ago, while hosting In the Know, I met Shannon Kadlovski, a certified nutritionist, local to York Region. Shannon and I immediately connected. She was able to explain healthy eating in a simple, non-judgmental way. She's taught me so much about the foods to put into my body, how to read product labels, supplements, vitamins, etc. What I love most, though, is her approach. "You do what you can," she often tells me, when I say I refuse to give up cheese and dairy. We often joke about how I can't handle sprirulina or wheatgrass (she's made me try both! ), but she's also introduced me to seaweed snacks, which I'm currently obsessed with. 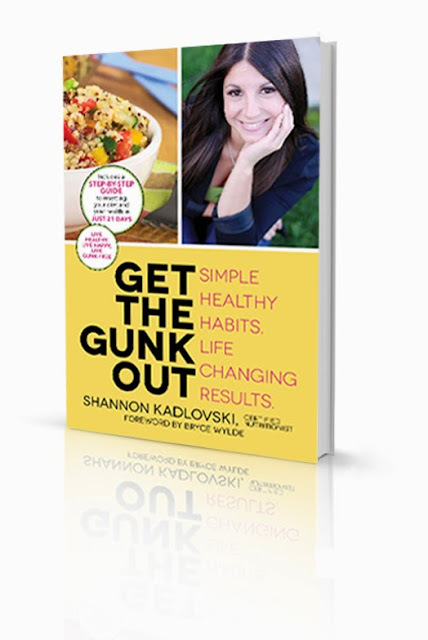 On June 11, Shannon's book Get the Gunk Out launches on amazon.com. What an accomplishment. Shannon has taken her best practices, lessons, recipes and put it all together in a handy tool that will teach you a thing or two, that's for sure. What I love about “Get the Gunk Out” is its accessibility. This lifestyle – not diet – allows you to make realistic goals without feeling guilty. The Gunk Shannon refers to is the extra stuff that manufacturers add to food, often without your knowledge. After meeting Shannon and reading her book, you will never look at a product label the same way. That is, you will DEFINITELY look at a product label and analyze it. Do you know all the words on there? Three weeks. 21 days. That's all you need to give this lifestyle a go. Why 21 days? Because that's how long it takes to make - or break - a habit. In these 21 days, there are some hard rules: no dairy, no caffeine, no alcohol, etc, and it's difficult, but totally doable. Once you get through the 21 days, you see what worked/didn't work for you and your lifestyle, and you adapt. And who doesn't love a good checklist? You're talking to the checklist, to do list, sticky note queen over here. I absolutely love that Get the Gunk Out has a handy-dandy checklist for each day. It re-enforces how well you did that day, and definitely keeps you honest. 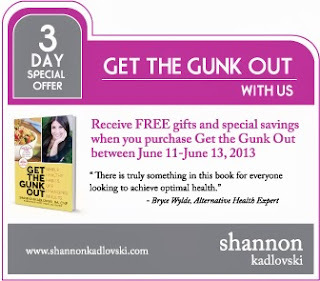 With your purchase of Get the Gunk Out between June 11-13th, you will receive more than $300 of FREE BONUS GIFTS including gifts from leading health and wellness experts, as well as special savings on a variety of health and wellness products. For more information on Shannon and her philosophy, you can visit her website. And if you absolutely HAVE to have that nutella sandwich, after your 21 days, it's ok :) She won't judge. All the best to my friend Shannon, and here's to a Gunk-Free future!